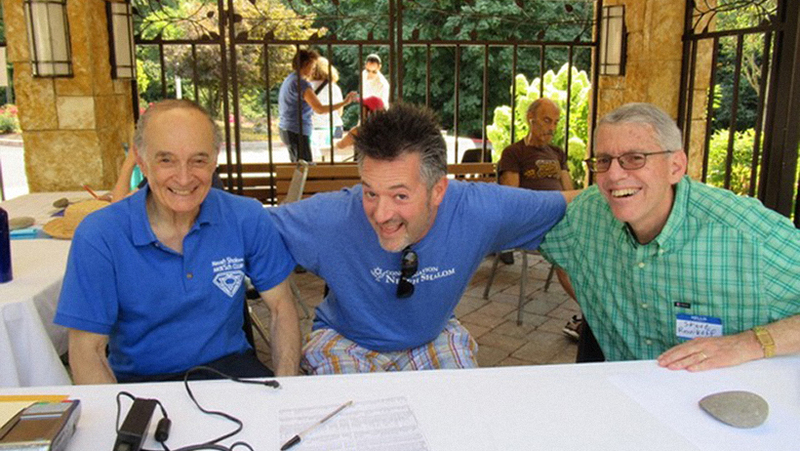 Neveh Shalom’s Men’s Club is a group in which many of our members forge long-lasting friendships. We offer volunteer opportunities, community activities, social events, and interesting speakers. In addition, we construct the congregational Sukkah, sponsor Yom HaShoah programming and volunteer with organizations such as the Oregon Food Bank and Habitat for Humanity. While our programs primarily target our male congregants, women are welcome, and we periodically co-sponsor events with Sisterhood. Most meetings are held one Sunday a month. Annual dues are $36 and new members receive a one-year complimentary membership. To the Congregation Neveh Shalom Community of Members, including men, their better halves, their children, and anyone else who wants to have fun, do good things for other people, make the world a better place, and, in the process, make some new friends, solidify old friendships, and strengthen your real life in-person social network. Have we got a year planned for you! As I’ve said in the past and I’ll keep saying, this is not your father’s, uncle’s, zaydie’s, or the old version of Men’s club. We’re taking it on the road. We’re planning events outside of Neveh Shalom on a regular basis. We’re building Sukkah’s, houses with Bilal Mosque friends with Habitat for Humanity, serving holiday dinner to homeless individuals, building the world’s largest toilet paper menorah, celebrating and helping Veteran’s, teaching the younger generation how to wrap tefilin while they teach us how to rap music, do a cross country skype Yom Hashoah event with a synagogue in Tampa Florida, listen to John Strong tell us about broadcasting Soccer for MLS and FIFA, listen to other speakers TBD (Jeff Mapes, Adam Klugman, maybe?). Go on a bike ride, monthly dinner outings, a weekend camping at Schechter or maybe somewhere else like Silver Falls, a hike, Top Golf, softball, etc. Poker, Ping Pong, Pool, Blazer Game, the ideas keep on coming. Let me know what you think and what’s missing! Take care and let’s text/email/talk soon!